Visit SriLanka Tours - The Home of great value Sri Lanka travel packages, Sri Lanka tours, vacations and holidays in Sri Lanka. Through this website we invite you to take a glimpse of Sri Lanka, which is not only the lustrous Pearl of the Indian Ocean, but one of the most exciting locations for your next tour, vacation. You will be enticed by the rich diversity of sights and sensations that this little island has to offer. Step into the island and discover. This is your one stop travel shop to find and book the best travel packages Sri Lanka has to offer. Choose a Tour Package or create one of your own and leave the rest to us. 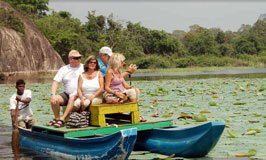 Contact us now and get one step closer to your dream Sri Lanka Tour today. Our goal is to provide a unique, unforgettable travel experience that reflects the traveller’s true desires and interests and perform this service with professionalism, creativity and knowledge. We want our clients to experience the real Sri Lanka, rather than see it. Southern areas are tropical with plains and hills. Central areas vary depending on the altitude from sub tropical to moderate temperate valleys and mid size mountains (5,000 meters). Northern areas/high altitude alpine climate Punakha is “California like” with temperatures varying from 5° Celsius to 17° Celsius in winter and in summer from 18° Celsius to 32 ° Celsius with a yearly rainfall of 600mm. Paro & Thimphu has moderate climate with temperatures of -3/12 in winter to 13/25 degrees in the summer with a yearly rainfall of 800mm. Summer shower season (July to September) evening rain with long dry periods during the day. Winter season (November to February) provides clear days and nights with a very comfortable climate. SriLanka being a very small country and a developing one has very few tourist accommodations which are luxurious but there are a lot of accommodations which offer basic necessities, especially as you travel further east. If you are looking for a bit of luxury then we can arrange for you to stay at 5-star establishments i.e. namely Amankora (in Thimphu, Punakha, Paro, Gangtey and Bumthang), Uma Paro and Hotel Taj. These establishments have been developed as a result of Foreign Investment in Bhutan. They offer a variety of privileges which are quite unique from the other establishments, therefore be prepared to pay for these privileges. Also now we have some local hotels which have improved the services and facilities such as Zhiwaling. We can also arrange for cooks to accompany you on treks and camping tours that are skilled in coming up with delicious meals. Our tour guides have good knowledge of the history and culture of Bhutan and are very hospitable in nature. They are certified by the Tourism Authority of Sri Lanka . The most common mode of communication is English but we can also provide guides who can speak French and Japanese. We have many other regional languages and the National Language we speak is called as “Dzongkha”, but English is very common among Bhutanese as well and is spoken fluently by most of us. Therefore it is the second official language and it is a medium through which communication takes place. Sri Lankan dishes consist mostly of vegetables, chili, cheese, chicken, beef, pork, yak, rice with "Ema Datse" is the national dish (chili & cheese stew) Momo (cheese or pork dumplings), Hogay (cucumber, tomato, onion, and cheese salad), curries with chicken or pork, Nosha Paa (beef and chili) – these are all popular Bhutanese dishes. Due to the hot flavoring and abundant use of chilies in the cuisine it is spicy. There is little to no seafood but on request you can get buffet style meals with choice of continental, Bhutanese and Indian Cuisine. Our cooks, who accompany the treks and camping tours, are well trained and equipped and can come up with delicious feasts every day. For beverages locals enjoy Yak Butter Tea (tea leaves, water, salt, & yak butter) and Ara (spirit distilled from rice).